A clean and tidy holiday home which is just a 2 minute walk to Matapouri Bay - surely one of the most beautiful beaches in Northland. The bach consists of 3 bedrooms which can comfortably accomodate 8 people. The bach is conveniently located close to the estuary which is a great spot to take the kids kayaking. We have 2 kayaks available to be used by guests. The property is fully fenced and is flat - ideal for parking the boat. We have recently added a large deck to the property which is great during the summer months. The bach is also close to some other magical spots - including Sandy Bay (surfer's mecca), Wooleys Bay and the beautiful Whale Bay. 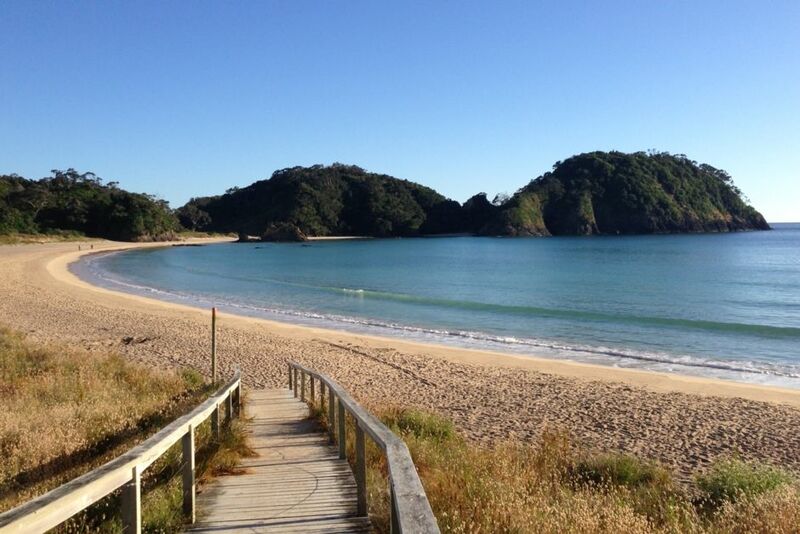 Tutukaka is just 6km away where dive trips to the Poor Knights islands or fishing charters can be arranged. There are many other activities that you can take part in during your stay - these include swimming, snorkelling, surfing, golf, walking, fishing, cycling and mountain biking. Golf courses are located at Whangarei (30 minute drive) and further north at Hikurangi. Pets OK but please keep outside and tidy up after them. Smoking OK but only outside. Please ensure all rubbish is removed before departing. Great Bach with everything we needed - kids loved the tramp! Beach and shop nearby. Really enjoyed our stay. A tidy, basic beach bach at beautiful Matapouri. Very convenient to the shop. Some water pressure issues - with shower very low flow, and toilet slow to fill. Girls washed hair in a bucket of water as this was easier. Matapouri is a truly fantastic spot. This bach is tidy and has a well equipt kitchen. Good mattresses on the lower bunk beds too for adults to sleep on if needed. It was perfect for our family with room for a boat to park. Good value for a 3 bedroom bach. Matapouri Haven is a very fitting name for John's place. Your typical kiwi bach getaway. BBQ with large deck to relax on. Kitchen with everything you will need. Kayaks for exploring the beautiful estuary and coastal areas. Great value for money. A bridge jump at high tide is a must. Easy stroll to the well stocked shop for fish & chips, coffee and anything else you might need. I would recommend to anyone.